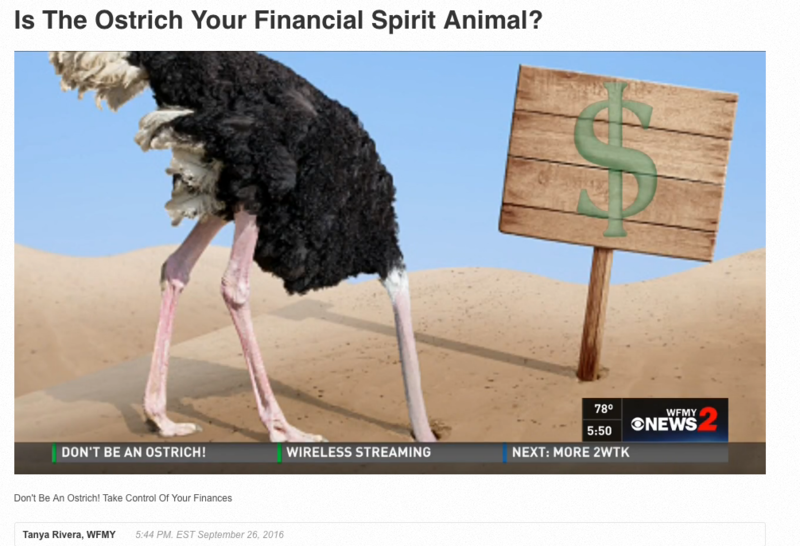 Are You An Ostrich When It Comes To Financial Planning? To watch my interview on WFMY click here. Retirement planning is about closing the gap between the life we want to live today and how we expect to live in the future. Not surprisingly, anxiety is a common denominator for most individuals who are unsure of how they will pay for their retirement. One way to avoid the uncertainty of retirement is to discuss your fears and hopes with a credible, certified financial planner. Early retirement planning provides an anchor that can stabilize economic dips and enable you to segue from a career status into retirement with minimum effort. However, retirement planning at any stage of the game is an essential first step. What would life look like if you were forced to retire in the next year or two? How would compulsory retirement impact you and your dependents? If you have savings, how long would it take to be depleted if unemployment lasted for more than six months or a year. Commit to a retirement saving plan. Spending and saving rules apply to everyone whether you are considering retirement or not. But let’s face it, spending is a necessary part of life before and during retirement. I agree with Wade Pfau, Ph.D., columnist for Advisor Perspectives, on this subject; the goal is to figure out which sort of variable spending strategy will be most appropriate for your personal situation. This will determine how much you can reasonably expect to save for your retirement. How much you are able to save will ultimately impact how you spend your retirement years. 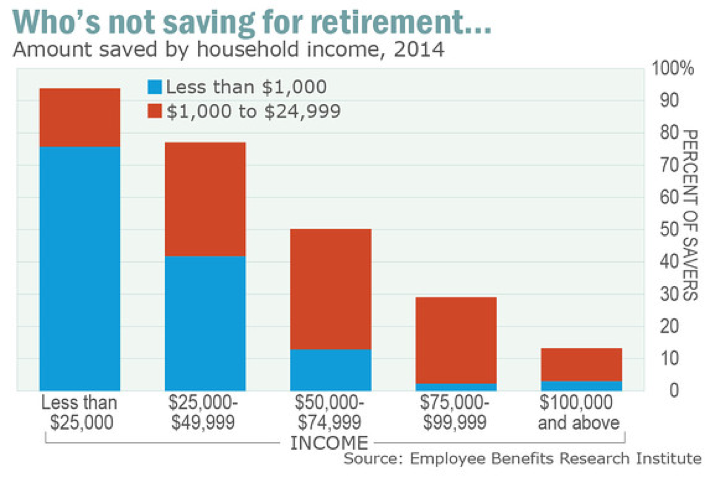 The following data from Employee Benefits Research Institute (EBRI) provided by Market Watch reveals retirement saving trends based on household income. 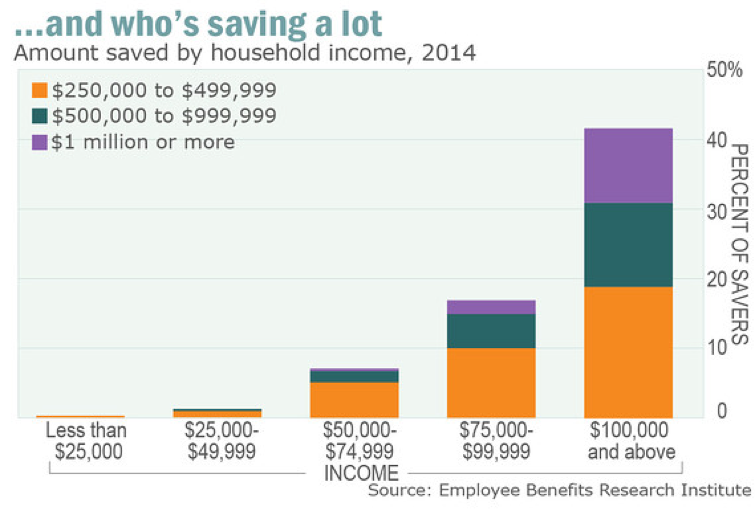 As the EBRI survey indicated, having a saving plan was a confidence booster even among lower income earners. Income earners who had access to a 401(k) or another type of workplace saving plan were more confident about their retirement even if they were not maximizing the plan’s saving potential. Plan for a retirement punctuated by work intermissions. To make subsidizing an uncertain retirement fund more feasible, advisors suggest exploring ways to expand your skill base beyond your current employment. According to a survey conducted by McKensey Global Institute, 60% of boomers expect to continue working after retirement. That is the only way most believe they will be able to maintain their current lifestyle or even to make ends meet. Unfortunately, there’s a significant gap between expectation and reality. Among actual retirees, more than 70% were not able to find employment during retirement. Of the 27% who found employment, some were part-timers who earned minimum wage or below their usual income bracket. Adequate preparation to remain marketable is therefore an essential criterion if working to offset the financial uncertainties of retirement is part of the plan. Keep your retirement plans realistic. Deciding how much income will be required to maintain your current lifestyle after retirement is a common problem faced by many people when discussing retirement. Unrealistic notions about retirement needs can lead to significant problems if addressed after the fact. Consult a financial advisor to explore your options and create a retirement action plan. A financial advisor will calculate a list of interconnected factors such as general household spending costs, taxes, and the economics of investments, retirement accounts, special expenditures, pensions, Social Security benefits and the potential for employment after retirement among others. Spikes in living expenses and inflated medical cost coupled with flat income streams and extended life spans can derail the best retirement expectations. The reality is that the average individual has approximately thirty-five working years to support daily life and secure sufficient savings and investments to sustain life for another thirty years or more of retirement. To be effective, retirement plans today must consider these innumerable variables in order to be strategic and progressive. Since corporations have eliminated pension plans and social security benefits are no longer adequate to offset cost of living, every individual is responsible to save and plan for a gratifying and secure retirement. Speak with a certified financial planner to help you create a feasible retirement plan that is tailored based on your personal needs as well as current and future living requirements. Feel free to visit my website at www.mattloganinc.com or email me at [email protected] if I can be of any assistance.